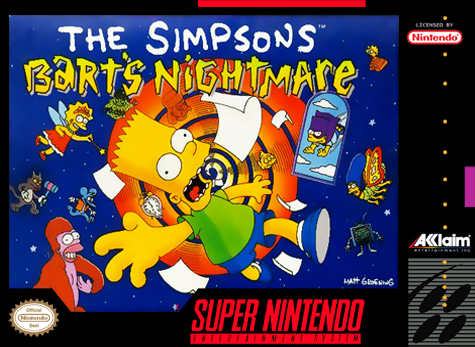 Simpsons: Bart's Nightmare for Super Nintendo has you face enemies like Homer Kong, Momthra, and Barney on a pink elephant in this lighthearted adventure. There are eight levels of action to work your way through and you have to collect a one-page report on each one in order to help Bart complete his homework and make it out of the nightmare alive. Using weapons like plungers, frying pans and radioactivity, you'll encounter many characters from the hit show Itchy and Scratchy and Otto. For 1 player.